You’re going to love this recipe…. 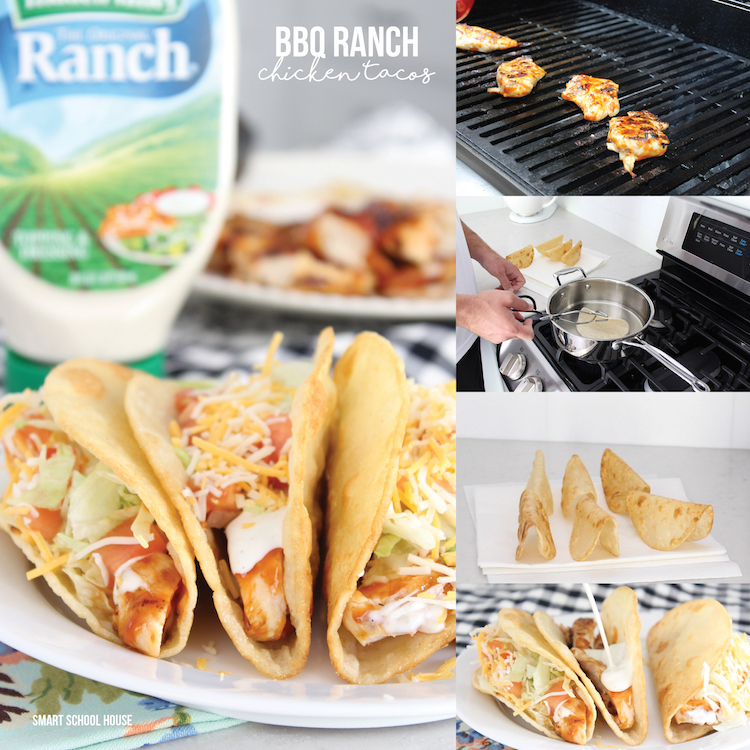 Watch how easily the delicious BBQ Ranch Chicken Tacos are made! Have you ever tasted the glorious mix of BBQ sauce and creamy ranch dressing? They’re a match made in heaven! Have you ever had a homemade taco shell? You absolutely NEED to try this out some time! Fill the bottom of a frying pan with a thin layer of vegetable oil and warm it up on low heat. We used about 1/2 cup for our size frying pan seen in the video. Caution: use only low heat to prevent the hot oil from splattering. Using tongs, lay 1/2 of a corn tortilla in the oil creating a bend like a taco shell. Hold it in place and let it cook until golden. Using the tongs, lay the uncooked tortilla half into the oil, grabbing the cooked portion and continuing to create a taco shell shape. Once both sides are golden, place them on some stacked paper towels and let them cool. Marinate the uncooked chicken breasts in BBQ sauce. BBQ as usual (about 15-20 minutes on medium heat), adding additional BBQ sauce as desired. Let the chicken “rest” or cool for a few moments. Cut the BBQ chicken into slices. Begin layering your tacos! BBQ chicken at the bottom, then 1/2 tablespoon of Hidden Valley® Original Ranch® Dressing, shredded lettuce, diced tomatoes, and shredded cheese. When I was a little girl, I remember standing in the kitchen watching (and smelling) my mom made the homemade taco shells. It was always one of my favorite meals. As we approach Mother’s Day, I love making this recipe with my kids running around in our kitchen. With graduation parties and summer just around the corner, there’s no better way to celebrate the season with family and friends than outside by the BBQ! Be sure to make lots of extra taco shells and BBQ chicken because once everyone tastes the creamy ranch dressing mixed with the crunch of the lettuce and taco shells, they’ll be searching for more! So simple, so delicious, and so perfect for summer. Want a chance to win a $100 Visa Gift Card? 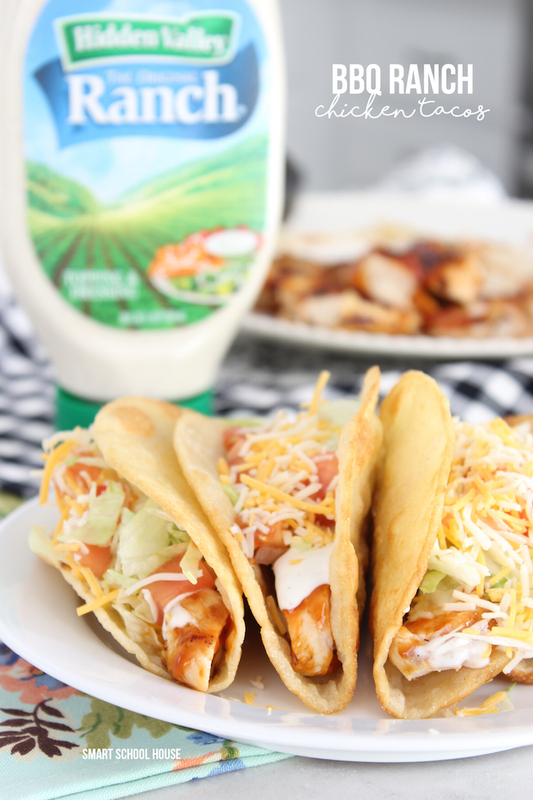 Leave a comment and tell us what your favorite Hidden Valley® Original Ranch® yum recipe. My favorite, and I do use this recipe, is the Crunchy Baked Ranch Chicken Recipe. The chicken comes out so moist and delicious. My favorite is the The Ranch Burgers! They taste so delicious! My favorite recipe would be the Roasted Corn and Radish Fish Tacos Recipe. Yum!! The Crunchy Baked Ranch Chicken recipe looks good! My favorite yum recipe is the Ranch Tortellini Salad! I like the Ranch Buffalo Chicken Pizza recipe. The Ranch & Chile Chicken Enchiladas Recipe sounds really good! I like Roasted Corn and Radish Fish Tacos. The ranch gucamole sounds delicious! The ranch cauliflower mash recipe sounds amazing and one I have to try out and soon. we love to make Ranch Buffalo Chicken Pizza! My favorite recipe is GREEK TZATZIKI SALAD. I think the ranch pizza sounds yummy! I’d like to try the spicy ranch pulled pork sandwiches and the original ranch fried chicken. I like to sprinkle it on potato chunks and bake them in the oven. I’d love to try the Ranch Potato Skins! The ranch chicken pizza looks so so good. My favorite is the Ranch Buffalo chicken pizza. The ranch gucamole would be awesome! My favorite is the Original Ranch Roasted Potatoes. I like it on a buffalo chicken sandwich! Yum! I would like to try the ranch burgers or the Italian ranch chicken. My favorite Hidden Valley Ranch recipe is hamburgers. It’s so easy and really adds a great flavor to the meat. I’m all about the Ranch Mac ‘n Cheese! My kids absolutely love tacos, and I love to make taco salad with salsa and ranch mixed together! Ranch Buffalo Chicken Pizza! Yum! My whole family loves Bacon Ranch Pasta Salad. My favorite is the ranch and chile chicken enchiladas. I love making bacon ranch burgers on the grill. I love to add the seasoning to my homemade chex mix. Hidden Valley Ranch Turkey Burgers! Breaded Ranch Chicken is a family favorite. I like the CRUNCHY BAKED RANCH CHICKEN. My favorite recipe is the Crunchy Baked Ranch Chicken. I like the Ranch Potato Skins recipe. Very reminiscent of my favorite twice baked potatoes. I want to try the PARMESAN RANCH OVEN FRIES recipe. They would be a great side for summer cookouts. Our favorite recipe is the taco ranch pasta salad. My favorite Hidden Valley Original Ranch yum recipe is my famous BLT Pasta Salad.